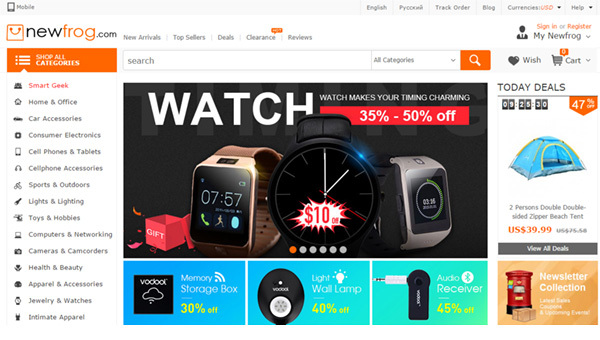 NewFrog is a Chinese internet shop that offers you free delivery and is quite popular among people who are into electronic gadgets. You can find computers and tablets, smartphones and accessories to them as well as accessories for iPhones and iPads, game boxes and many others. The headquarters of the company are located in the city of Shenzhen which known to be one of the most dynamically developing cities in China. New coming products are added to the list every day and the NewFrog's team is always seeking for new items in order to satisfy the needs of its clients. As one of the biggest electronics supplier the shop always offers competitive prices to its clients. Wholesale discounts are given absolutely on all products that are shown on the site. There are also different types of discount offers proposed to the clients in order to make the price lower. Moreover, depending on the history of your orders, the shop may reward you with a one-time discount that is very appreciable. There is no order-price minimum – you can buy one product for a trade price from the NewFrog online shopping website. And wholesale traders are also able to receive even bigger discounts depending on their order. Even though the prices are extremely low the offered products are of a very high quality and positioned on a good level. The shop gives a guarantee on the quality of its consumer electronics and provides a serious control from the moment of your order to the end of delivery. Totally fake reviews. Dont trust this company. Excellent company to deal with.Very reasonably priced.Great response. Shopping experience is very good. Price of the products is very competitive. Delivery time as expected for a free of charge shipping.Specs of the product exactly as described in the web site. Very competent customer service. I found newfrog.com the best wholesale online, thier service is very good en shipment is quickly! Today's Deals! New Deal Every Day! Get Up to 70% off!